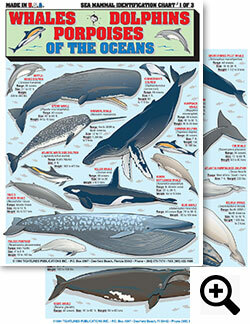 Both Novices and Pro's all over the world find something interesting in any one of the Ocean Identification Charts. 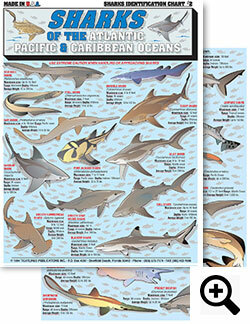 Tightlines Ocean ID Charts also can be found in the New (I.G.F.A.) International Game Fish Association Museum and Library in Dania Beach, Florida. All ocean identification charts are 3mm Laminated to ensure 100% percent Waterproofing, and can be rolled up to fit into any tackle box. Tightlines Publications is proud to announce that they are the Leader in Fishing, Marine, Hunting, and Navigation Charts. From Bait Rigging to Rules of the Road you can't go wrong with a Tightlines Charts at your helm. 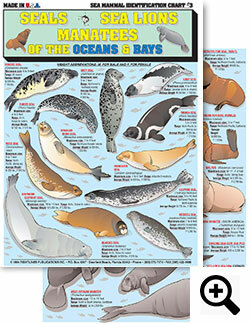 Sea-Mammal's Identification Chart #3- Seals / Sea - Lions / Manatees Contains: Hooded Seal, Grey Seal, Harp Seal, Ringed Seal, Hawaiian Monk - Seal, Ribbon Seal, Ross Seal, Southern Elephant Seal, Crabeater Seal, Leopard, Seal, Weddell Seal, Bearded Seal, California Sea Lion, American Sea Lion, and more. 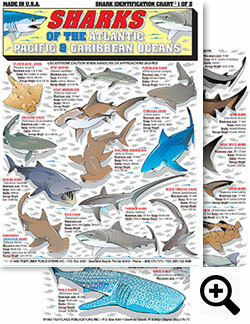 Shark's Identification Chart #2 Sevengill Shark, Frill Shark, Saw Shark, Dusky Shark, Sandbar Shark, Port - Jackson Shark, Silky Shark, Smooth Hammerhead Shark, Greyhound Shark, Blacktip Shark, Bull Shark, Snaggletooth Shark, Grey Reef Shark, Leopard - Shark, Zebra Shark, Ornate Wobbegong Shark, Sixgill Shark, and so much more.